Valium works by slowing brain activity, helping curb anxiety. More on Valium action and duration times, as well as what make Valium work better here. Valium (diazepam) is a an anti-anxiety benzodiazepine drug that’s used to treat mood disorders, muscle spasms, and alcohol withdrawal symptoms. How does Valium affect the body and brain? Does it have the same effects for everyone? What are the dangers and side effects of Valium use? Is Valium addictive? We’ll explore all those questions and more in this article. And we invite your questions about Valium at the end. 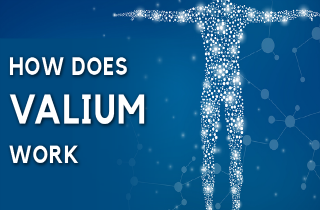 How does Valium work in the body? Valium affects the levels of gamma-aminobutyric acid (GABA) in the brain, helping to slow down and stop abnormal brain activity. This results in a calming effect, and sometimes feelings of euphoria. It helps reduce anxiety, cause sleepiness, relax muscles, stop seizures, and more. Valium can also have pleasant side effects such as altered mood, or relaxed state, but Valium can also cause unpleasant, and sometimes dangerous, side effects. The most common adverse side effects to Valium include drowsiness, stomach problems, and mood changes. But more serious issues such as seizure, irregular heartbeat, or tremors can occur, even at normal doses. There’s no way to predict who will experience these adverse effects, but they’re more likely to occur when Valium is taken in higher doses than prescribed. How does Valium affect the brain and nervous system? Valium is a central nervous system depressant. This means it slows brain activity. As a benzodiazepine, Valium interacts with neurotransmitters, especially GABA neurotransmitters, in the brain. Specifically, the diazepam in Valium binds with high affinity to the GABA A receptor in the brain to reduce arousal and to affect emotions. Diazepam further depresses the electrical after-discharge in the amygdala and hippocampus regions of the limbic system that affect emotions. Do you get high from Valium? Possibly, but not always. If you are using Valium therapeutically and taking Valium as prescribed, the chances that you become addicted to Valium are limited. Valium hits peak blood concentrations about 1 – 1.5 hours after being taken orally. At that point, Valium has taken full effect. Sometimes people will crush and snort or inject the powder from Valium tablets to try to get more immediate effects, but this is dangerous and can result in increased adverse effects, nasal infections, or overdose. How long does Valium work? The half-life of Valium is fairly long – it can take 20 hours or more for just half of the medication to be eliminated from your system. However, just because it’s not completely eliminated after 20 hours doesn’t mean it’s still effective. On the contrary, Valium is generally taken anywhere from 2-4 times per day in order to be effective. What makes Valium work better? Valium sometimes works better when taken without food. It’s better to take Valium a couple of hours after your evening meal, so that it absorbs faster into the body. On the other hand, Valium should not be taken along with other central nervous system depressants like alcohol or benzodiazepines. It can cause excessive drowsiness and even be dangerous when mixed with other medications. Does Valium work for everyone? No, Valium is not right for everyone. Valium is a habit-forming medication that’s not recommended for those with a history of drug or alcohol abuse. If you believe that you or a loved one are addict to Valium, there are many kinds of sedative addiction treatment programs available to help you get sober. In some people Valium can have serious side effects. People who experience problems while taking it should talk to their doctor immediately about discontinuing the medication. People with certain medical conditions should not take Valium. Finally: Can you die from Valium? Yes. Although it is difficult to take too much Valium and overdose on Valium usually requires hundreds of times the daily recommended dosage, or combing Valium with other drugs or alcohol. Please leave us your questions about Valium below. We try to respond to all questions personally and promptly. If we don’t know the answer, we will refer you to someone who does. I have a 2 year old i have suffered trauma in the past and i cant function without valium. I can go without it but i have panic attacks and nausea it is very hard looking after a 2 year old all my kids are grown and at work. I dont take much and have even bought Gaba from Holland and barat which is fairly effective but i also take pregabalin. All this because my nervous system is way too overactive im sad that i need to take this ive tried not to but my past PTSD will not let me forget the atrocities. Im also on sertraline 200mg could this anti depressant be making ny Gaba receptors way too alert? I am about to have a steroid injection in my hip for bursitis I am nervous about the pain of the injection it has been recommended that I take Vallium as a sedative, what can I expect from the Vallium medication, will it relax me enough and take away my fear. Hi Jan. Valium is used for treating anxiety, and may have a calming effect. BUT, I suggest that you consult with your doctor before taking anything since it may cause some interaction with the injection. I’ve taken over 50mg of valium and have noticed that every now and then they don’t work.. I don’t take them every day, so i don’t think it’s a resistance thing. Or maybe it is. What are your thoughts? i all so take duloetine hcl 60 mg should i tacke them a part ? Is it safe to take Benedryl and Valium hours apart from each other? I took Valium (5mg) earlier in the afternoon And Benedryl (50mg) at 11:00pm is it ok ? Hi David. I’d suggest that you talk with your doctor before taking any medications. I spoke with a doctor recently about a bad incident with Benadryl. I had been abusing nightly (50mg) for about 2-3 months and had a negative experience with it. I’ve been off of it for almost 6 weeks cold turkey but still experience tingling in the left side of my body, irregular heartbeat, muscle spams in my neck, anxiety, memory problems, just an overall feeling of surrealism and issues with sleeping. He prescribed me valium for the muscle spasms and kind of shrugged off the effects that the Benadryl had after quitting it. I’m worried about it being a benzo and a bit paranoid that it’ll make things worse if I have an underlying issue with brain damage. That and I worried about the addictive qualities that it has. They’re 5mg and very small but have yet to take them because if I can have a problem with Benadryl then could valium make it worse? I’m a bit paranoid. I would very much appreciate some insight on this if anyone knows anything. Can Valuim and Lexapro be taken together? Hi Tim. I suggest you consult with a doctor or a pharmacist if those two medication can be taken together. Can taking Valium cause bifrontal atrophy ( shrinking of the brain)? Hello Desley. The research of Malcolm Lader, an expert on benzos at London’s Institute of Psychiatry, suggested that the brains of regular benzodiazepine takers (including Valium) were damaged and shrunken in comparison to the brains of people that weren’t on benzo medications. However, he also noted that his preliminary findings needed more research. I have a question how do people use Valium like for example do the just swallow the pill or snort it?? Hi, Brian. Valium is used orally (swallowed) as prescribed by a doctor. Still, it can be snorted, chewed, crushed, and even smoked. But all these ways of using Valium are considered as abusive. I need to take valium about a week before I fly as I’m phobic about flying. I normally take fiorinal for migraines every day. How many hours do I have to wait if I take a valium in the am to take my fiorinal in the pm? Hi Brooke. I’d advise you to ask a pharmacist for general guidelines on when to take your medications. For issues such as this you should always leave it at professionals. is it ok to take Valium every now and then? The ONLY thing that helps with my severe anxiety (esp. in early AM) is Valium. Even 5mg does the trick.I also suffer from acute depression and have been prescribed many anti-depressants (Wellbutrin, Remeron, Paxil, Celexa, Nortryptaline, and others). Prozac worked for many years in combination with Cylert (no longer on market). I may try Prozac again. Celexa worked well for a few weeks but I eventually maxed out on the dose and it stopped working. I’ve been told that I have to limit the amount of Valium I take and I wonder what the safe dose is. I’m going to try Gabba and a light machine. Why am I worse in the AM and begin to feel better towards 4PM or so? Any suggestions would be appreciated. Hello Erika. The dose he took is a lot. A person should only take up to 10 mg of Valium at one time, and that’s only if someone is tolerant to the medication. The recommended daily dose of Valium is no larger than 40 mg taken throughout the day. I’d suggest that you call 1-800-222-1222 to contact the Poison Control Center for an over the phone assessment of the risk of overdose and for intruction on what to do next. I care for a 38 year old Veteran and he has taken 26 5mg in one hit. He thinks it ok! It’s not is it!! Hello Alice. I’d suggest that you check in with a pharmacist to inquire about possible contraindications. I have been prescribed 5mg of valium to help with my anxiety/depressed state. The doctor suggested 1 tablet at bedtime and 1/4 during the day as needed. My anxiety levels seem to waft and wane and I do not understand why. I cannot settle to do anything, focus on anything, can’t read, can’t do anything to help and simply feel totally empty. Going for a walk even though it is very difficult to do so, seems to help in the short term. Will the valium help me to recover or is it just masking the symptoms? I don’t feel I could cope without something. Hello Lawrence. Onset of action depends upon method of dosing / mode of administration. Are you taking Valium orally? Valium overdose: How much amount of Valium to OD? How much Valium is too much? Can you die from taking Valium?